Every New Year, small and large businesses have a close look at the growth opportunities available and come up with new marketing initiatives and campaigns to drive this growth. SEO marketing has been a major force in business development over the years. With new trends, adjustments and updates related to SEO being made online, businesses have to prepare well for 2014. So what exactly should you look at to inform your next move? 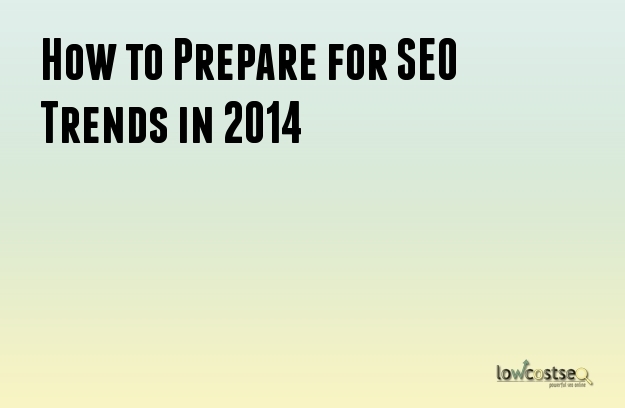 How have you prepared yourself for SEO in 2014? This still remains a focal point when it comes to successful SEO marketing and implementation. Going by the strides made in the last few years in regards to Google changes, it is paramount that business owners focus on being better than their competitors. Being unique is no longer the in-thing, add value, educate your audience and make use of influencers in your market niche and use them to market your content. Content has always been and will still be the driving force in SEO. To avoid shortfalls in 2014, prepare to offer compelling, differentiated and descriptive content. This should be done in a timely manner and in such a way that it can easily be placed and shared on social sites and other websites through a guest blogging program. Get down to eliminating duplicate content and pages on your site. For any content you decide to create or retain in 2014, make sure you identify authoritative sources of insight from within your site or beyond in doing so. Ensure that your content is also optimized for mobile searchers. Businesses that will truly make use of the vast media network will be the biggest SEO winners in 2014. Create a reliable network of writers, editors, bloggers, journalists and industry influencers to write and share your business content. Their expertise is crucial in helping you build effective SEO content that earns attention. The expanding digital divide in computer and mobile internet access, has greatly fueled the need for business owners to invest in adaptable and unique sites that can be viewed on computers, smartphones and tablets. Responsive web design is the ultimate goal to achieve this. It will boost your SEO efforts by improving user experience, increasing visits, improving search engine results, reducing bounce rates and encouraging more social shares. In 2014, the roles of SEO experts will continue to be of much influence in how businesses implement their marketing strategies. However, SEO agencies are expected to join hands with traditional public relations and marketing communication departments to fine tune marketing efforts. This is what is now being called “Digital PR.” Our SEO experts from Lowcostseo.com will deliver powerful, effective and affordable SEO services for your business.